Ducati became the first team to launch their 2019 MotoGP team last Friday. Having said goodbye to Jorge Lorenzo who has joined Honda, the Bologna factory welcomes Danilo Petrucci alongside Andrea Dovizioso for the 2019 MotoGP season. Petrux and Dovi were joined at the launch by Michele Pirro, who will once again be spearheading the Desmosedici’s development as Ducati’s MotoGP test rider in 2019. There were a couple of things to note about the launch. The first was the livery. 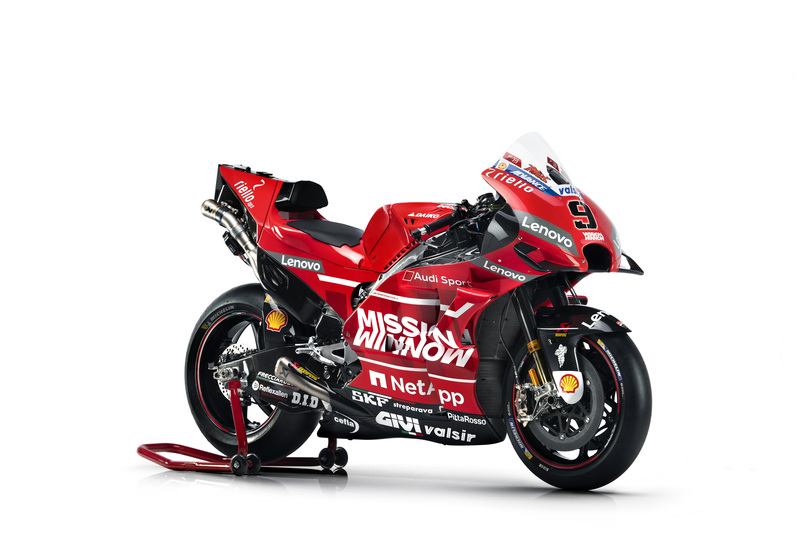 Two things were notable: Mission Winnow is now a major sponsor of the Italian marque’s MotoGP team, bringing Phillip Morris International back to the forefront of MotoGP (although they had maintained links with Ducati since losing their place on the Desmosedici’s fairing back in 2010 due to tobacco sponsorship regulations); and Audi Sport is now visible on the side of the GP19, a sign that Ducati is very much not for sale. Another item of note in the launch was that Gigi Dall’Igna is not particularly impressed with MotoGP’s aero regulations. The Italian brought wings to MotoGP back in 2015 and ever since has kept Ducati at the forefront of aero development in prototype motorcycling’s premier class – and now in the production-based premier class, too, with the V4R. As such, Gigi would very much like for the regulations surrounding aerodynamics in MotoGP to be nice and relaxed, so he could turn the Desmosedici into an upside-down biplane – or triplane, or more. As it is, he and his Italian engineering squad are quite limited in what they can do with the aero – hence they looked at rear wings in Jerez, although to little success, as well as a FUBAR rear end, designed to help rear contact under braking. Something Dall’Igna was happy about, though, was that they had managed to find more horsepower out of the L4 motor, which will no doubt delight the opposition. Whether this additional power will be sufficient enough to cause any significant problems with the electronics remains to be seen, but Ducati has proven itself the most effective user of the Magneti Marelli ECU since it became mandatory in 2016, so should problems arise you would expect them to be resolved fairly quickly. The relationship between Andrea Dovizioso and Danilo Petrucci this year will be a fascinating one. Compared to the mutual co-existence between Jorge Lorenzo and Dovizioso from the last two years, the Ducati box could be comparatively cheery this term, with the two Italians already working well together – Petrucci is even using Dovizioso’s trainer and psychologist, as well as training motocross together with his 2019 teammate. A strong relationship with Petrucci could prove vital to Dovizioso’s title chances this year – he needs a wingman who is willing to ride shotgun rather than play team leader in a situation like Valencia 2017 if he is to take on Marc Marquez. One thing that was missing from the team launch was the GP19 itself. 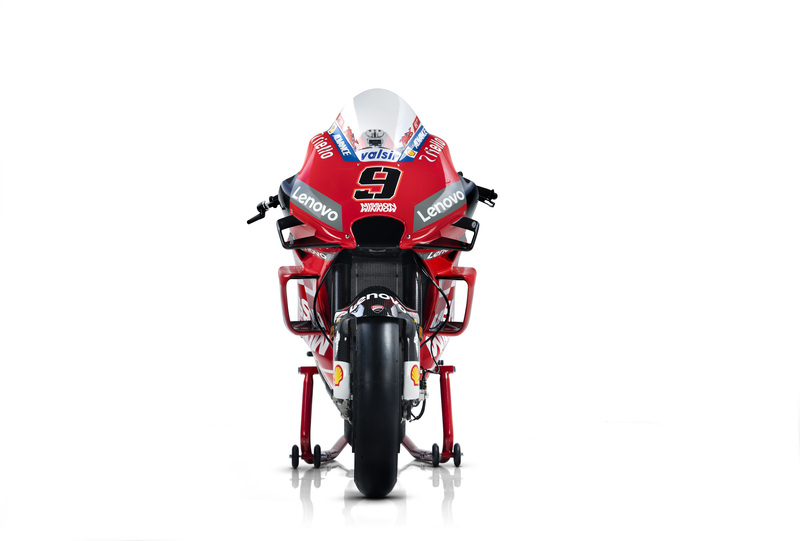 A late GP18 resplendent in Ducati’s new livery was used, because they don’t want to advertise their new ideas for free to the likes of Honda, Yamaha, Suzuki and the likes. The first opportunity we will get to see the GP19 will be in Sepang, on February 1st for the pre-Sepang-test-test. Michele Pirro will ride the Desmosedici there, before Dovizioso and Petrucci get their hands on the latest edition of the Bologna Bullet for the first time on February 6th for the Sepang test ‘proper’. The next team to launch their 2019 MotoGP programme is Repsol Honda, on January 23rd.